Many city governments have embraced sustainability goals in the last ten years, with a particular focus on reducing carbon emissions. Newark has taken a different approach. Largely due to activism from residents affected by pollution, in Newark, sustainability focuses on public health, quality of life, and expanding "green" job and business opportunities. These goals were codified in Newark's Sustainability Action Plan, published in 2013, with specific actions to promote better air quality, clean water, more trees and parks, more gardens and urban farms, and beautification of the neighborhoods. 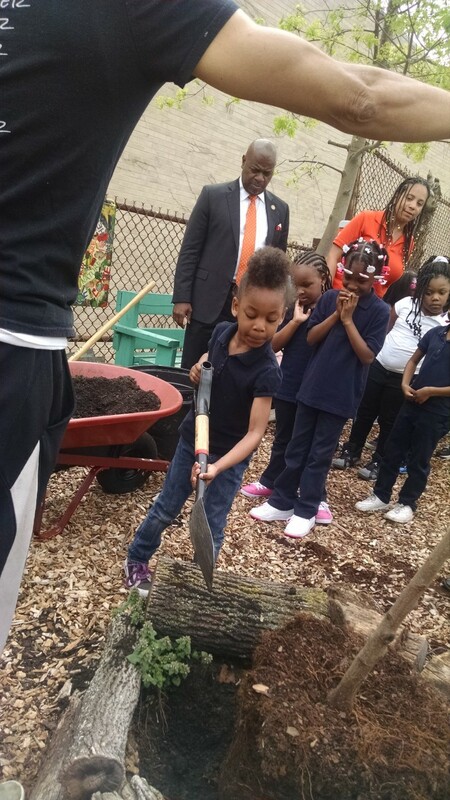 Mayor Baraka has directed Nathaly to continue to implement this plan, with special attention to areas that align well with Victoria Foundation grantee activities and the overall mission of the foundation: community greening, including through "green infrastructure" to manage storm water, and youth leadership and career exposure. As an office of one, Nathaly has moved to engage both city staff and residents through a "Newark Green Team" that tackles priority issues in a collaborative fashion. This team as well as the members of Newark's very active and able Environmental Commission, worked over the summer with the help of a small army of student interns to hold Listening Sessions attended by Mayor Baraka in all five wards to solicit feedback from residents throughout the city. The results will be fed into a revised Sustainability Action Plan to be published in 2018 - the 10th anniversary of Newark's first Sustainability Office hire. Early wins include supplemental college and career exposure activities for Summer Youth Employment participants engaged in environmental projects and the launch of a "Healthy Homes" team focused in VF's target neighborhoods of Upper Clinton Hill and Fairmount. Victoria grantees, such as Newark DIG, NY/NJ Baykeeper, Clean Water Fund, Ironbound Community Corporation, Greater Newark Conservancy, Project U.S.E., La Casa de Don Pedro, Urban League of Essex County, Trust for Public Land, Unified Vailsburg Services Organization, Great Swamp Watershed Association, Student Conservation Association, and NJ Environmental Justice Alliance, are all participating in the city's Sustainability efforts. Tuesday, 19 June 2018 Victoria Foundation granted $1 Million to the Pi Chubb Newark Field Trip Fund to support field trips for Newark students. Tuesday, 19 June 2018 How goes it Dale? Monday, 11 June 2018 The Thriving Neighborhood Initiative is our newest effort to empower neighborhood residents!